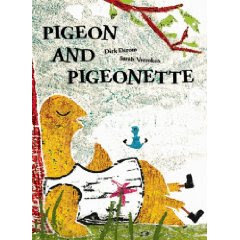 Pigeon & Pigeonette by Dirk Derom, illustrated by Sarah Verroken. Enchanted Lion Books. 2009. Official book website. Review copy provided by publisher. Picture book. The Plot: Pigeonette, small, can see but not fly; Pigeon, large, can fly but cannot see. What will happen when these two become friends? The Good: Pigeonette's small wings means she is left behind in winter, hopping across the snow. Pigeonette cannot see. Eventually they realize teamwork will save the day, with Pigeonette shouting instructions ("Flap!" "Turn Right!") as Pigeon flies. Pigeon and Pigeonette is a beautifully illustrated story of teamwork between friends, with each using their own strengths. The illustrator, Verroken, wrote and illustrated Feeling Sad. I love her work. As in Feeling Sad, Verroken uses woodcuts; but with Pigeon and Pigeonette, there is much more color, from the pigeons to the grass, the trees and leaves. The background is awash in colors; greens, blues, reds, browns. Even the endpapers are delightful; the soft background colors, with two sets of footprints, one small, one big. The publisher's website for this book, Pigeon and Pigeonette, provides not just samples of Verroken's work but also book-related games, coloring pages and such. In terms of "cool fun facts," Derom and Verroken were both born in Belgium and now live in New Zealand.